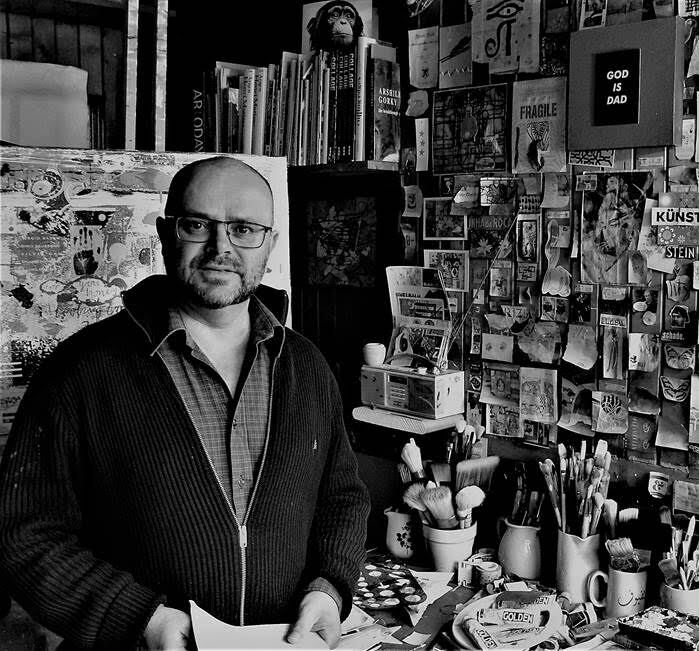 Nestled in a listed timber building, layered with time and industry, I find Colin Brown working on his latest painting. Natural light from the window streams in on the easel, illuminating layers of detail and experience. 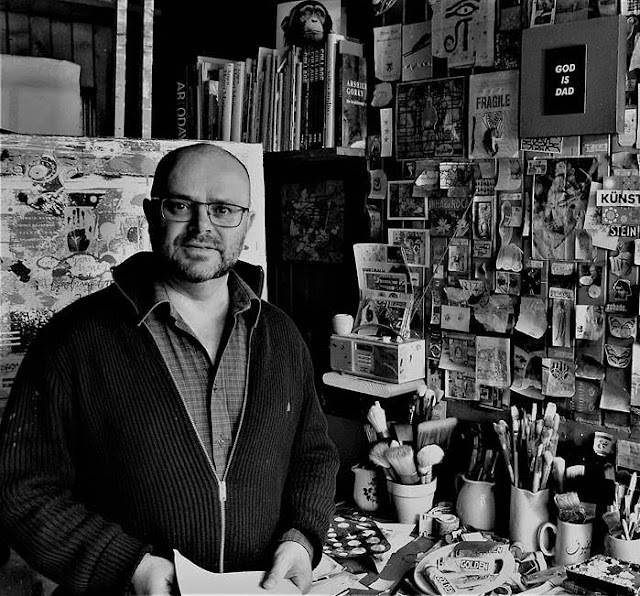 For twenty years Brown’s studio in the Northeast coastal town of Stonehaven has been a harbour for his practice. For an artist driven to excavate cumulative human marks, it’s a welcome place of regeneration. Here he can sift materials gathered from his travels and transform them into dynamic, finely balanced compositions. 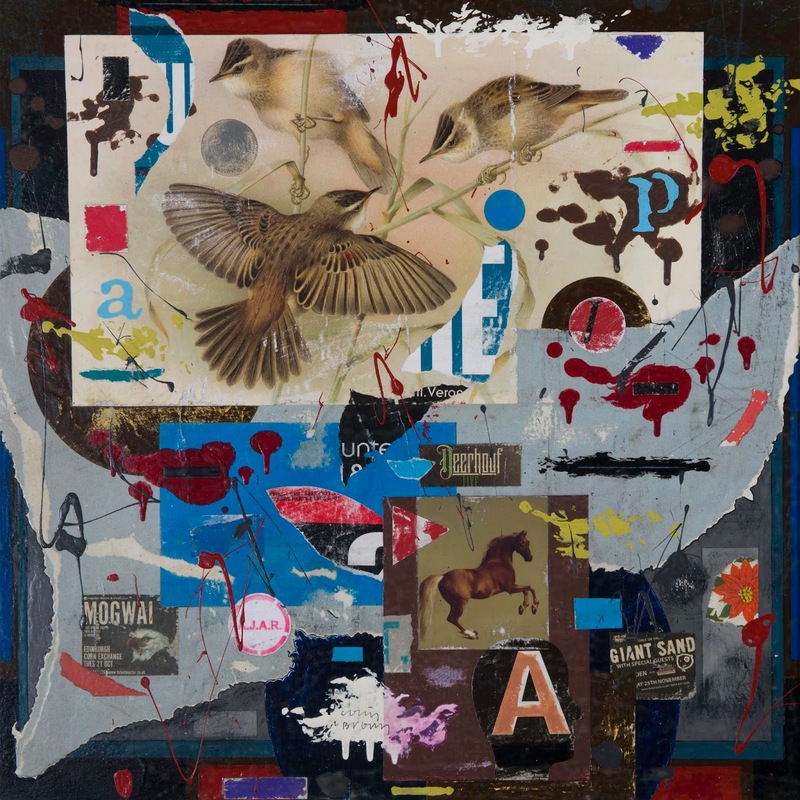 Brown’s distinctive work combines painting and collage techniques, formal design and accidental marks in ways that evoke the passing of time and experience of generations. We feel that these highly crafted surfaces could be sections of city walls plastered over with signage, subject to erosion and the density of human life. Unlike many post Warhol contemporary artists that use urban fragments, Brown’s emphasis is not mainstream cultural references or commentary. The energy of European cities like Berlin with their human history and vibrant reinvention, free his work from the dead shine of American Pop Culture. The foundation of Brown’s practice is figurative art and the discipline of painting that dominated Scottish Art of the 1980s. Whilst a student at Duncan of Jordanstone College of Art, Dundee, Brown observed a generation of Scottish artists strongly focused on humanity including Stephen Campbell, Joyce W Cairns and Ken Currie. 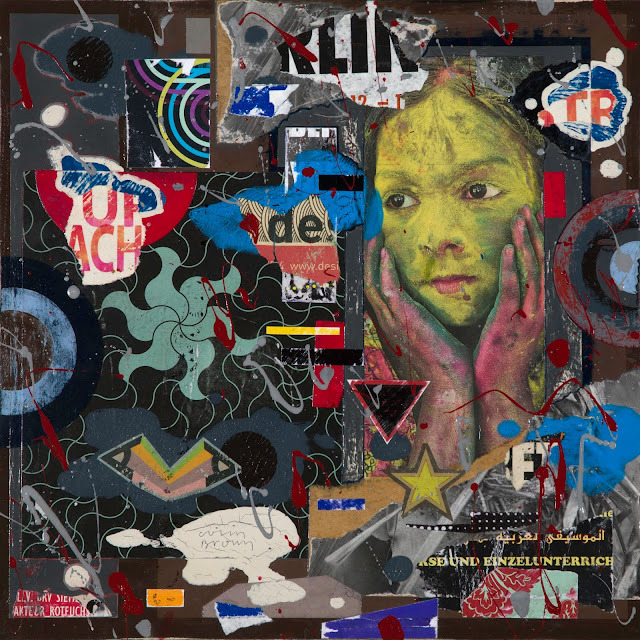 He also discovered “the Dad-ist ideal of looking at society in fragments.” An abandoned jute factory became the ground for three-dimensional collage works and assemblage from architectural elements. The potent vision of German artists of the interwar period including Max Beckmann and Otto Dix, the impasto choreography of American Abstract Expressionism and the sculptural paint handling of Anselm Kiefer continue to inspire him. As a recipient of the RSA John Kinross Scholarship Brown’s experience of living and working in Florence and four years spent in Düsseldorf established strong connections with Europe. 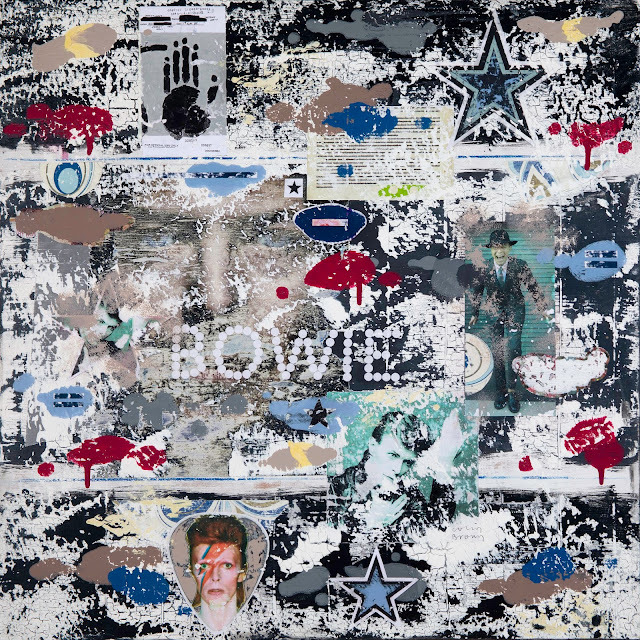 Recognised internationally for his innovative use of paint and collage, Brown received The Pollock- Krasner Award from the Pollock-Krasner Foundation, New York in 1996 and has featured in Fine Art publications; Collage- Assembling Contemporary Art, edited by Blanche Craig (Black Dog Publishing, London) and Cutting Edges-A Survey of Contemporary Collage, edited by James Gallagher and Robert Klanten (Gestalten, Berlin). Brown’s appetite for urban culture, awareness of history and understanding of painterly techniques helped shape his unique style. A vintage palette of chalky emulsion, rich industrial enamels, oils and acrylic paint, combine with layered imagery, collaged text and handwritten pencil script, to create rich fields of association. In a Brown painting, weathered cracks of separation are punctuated by energetic drips and splatters of paint. These contrast with images from Indie music, cinema, scientific illustration, sport and art history as triggers of thought and feeling. His work carries no prescribed meaning and the viewer is freed to make their own connections. Brown’s use of recycled materials and mastery of composition place the human mark back at the centre of art to reimagine an age of consumerism. When I see the artist’s studio wall of collected writings and imagery, they present an entire field of synaptic sparks and worlds of possibility. I am reminded of a creature that sits on the edge of the world absorbing signs of life and listening to the stories of birds. This is what a great artist should be: an explorer and re-teller of tales, and it is undoubtably what Paul Bloomer has achieved in his latest works. 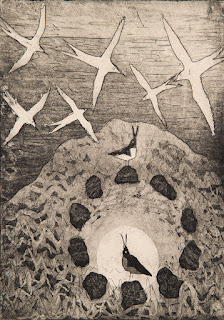 In this series of sixteen etchings Bloomer shows us events from the lives of birds around his adopted home in the Shetlands. This ornithological realm is unencumbered by the wayward vices and borders of human society, a reminder that there are other ways to be. It is also a story about the time-compressed and precious light of Shetland’s ‘simmer dim.’ After this comes autumn and winter. There is a cycle of time that we should live by. 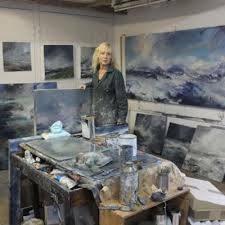 JANETTE KERR is known for her elemental paintings. Here she writes about the sea and why it is an inspiration. It is the periphery of the land that I am drawn to – the far edges of a place, margins between land and sea which blur with the ebb and flow of tides; areas that feel remote and uninhabited, which seem touched more by the erosion of land, actions of wind and rain, than by human occupation. So Shetland and north to Svalbard are obvious locations for me; exposed to the full force of the oceans, generating high winds and agitated seas, they are places of extremes.